Please add only SERIOUS BUGS, not just personal annoyances here. Don't go on and on about how abysmal it all is - and it IS DISMAL Add the Bug and perhaps a constructive note, I imagine Admin are as disappointed as us. We need to be constructive. Make certain that you set Preferences in your PROFILE (Logo up Right) to receive notification by email, of updates in your Forum Items. A report (from ZA) that it's difficult to make more than a few Observation is one Session. Please use the new site as a TEST BED - the clutter may be a nuisance but it might be to the good. Please do not report an error more than once here and keep it clean and easy to read PLEASE. Where are our iSpot badges? If you click on your icon (D) you will see a list of failed badges. So presumably at some stage this bug will be fixed and our badges will show! WHERE ARE OUR OLD FORUM PAGES???? 5 years of community work, interaction and information gone! No: click on your icon: there hidden in the junk of html is links to all our iSpot badges. This is independent of all the Forum badging which I don’t care about at all, except that I want rights to organize the forum into a hierarchy of topics (e.g. iSPot Groups, Societies and Regions, FAQ, Improvements, Bugs, Dictionary issues, etc.) 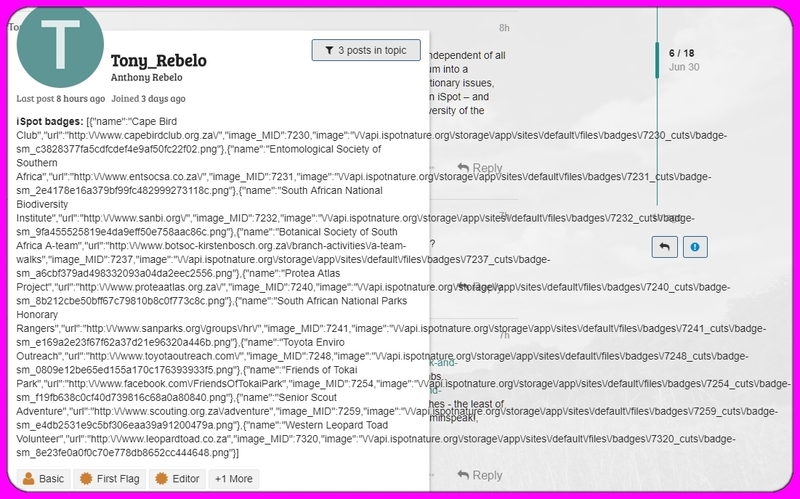 – for instance our Southern Cape group want their own forum pages: you could do that on iSpot – and they did!! Over 200 pages in that “topic” alone, relevant to the mapping and recording of biodiversity of the region. It takes 17 seconds to load a single image on my observations. Is this how it's supposed to be? My test just now four seconds at 2.2mbps with this https://www.ispotnature.org/communities/uk-and-ireland/view/project/730608/checking-for-new-marine-posts/observations-gallery load of Thumbs.. But average of 25 secs for individuals like here https://www.ispotnature.org/communities/uk-and-ireland/view/observation/717730/seaweed-on-the-thames-2017. The whole site has slow patches - the least of our worries really. Do remember your connection and device speeds are relevant here (ha, adminspeak!, sorry). I'm on a University connection with a 147mb/s download speed and a 94mb/s upload speed - shouldn't take nearly 20 seconds to show an image! I have been uploading large images and they have not taken this long but they do seem to take a bit longer than they should, possibly this is someting to do with the thumbnail creation process. I have also noticed some unusual behaviour when creating new projects, the images do not appear at all then if you go away from the project and return then the images are present. When I went to the help button the reply was : "Page not found". Not checked just now but there is a bug with identifications: basically every observation says no identification made until you click on it and discover there has been an ID. 1 People agreed with my observation. Really? No preview before posting a new observation. The one which summarised the total no of observations; most comments; your favourites; observations recently vied by you / others.... etc. I would like it back please, with one improvement - that "your projects" are also listed on this page. Creating an interacting observation is not functioning? Perhaps its just me being daft. After extensive research and consultation (joking) they have redesigned ispot. I wonder what exactly was so bad about the previous version? Was it a security issue that necessitated some changes? But what has happened is that some of the most useful functions of the previous version are lost, some basic functions (eg identifications made) don't yet work; some of the least useful aspects of the old version (eg the much derided quizzes) have been surprisingly retained: except they no longer work (I just tried a few in desperation at the lack of functionality of everything else). Also I wonder if anyone other than the users will read or respond to these points?